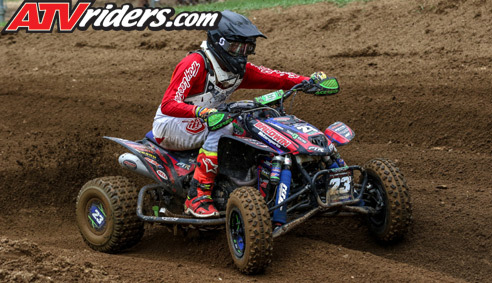 Deforest, WI (7/25/2018) – Kyler Lenz Motorsports/Amped Apparel Honda rider Korie Richmond scored a pair of victories during the AMA ATV Motocross National Championship races at RedBud MX in Buchanan, MI. Pro rider Sam Rowe finished sixth and cracked the top 10 in points. Nick Moser, having clinched the 25+ title at the last race, sat out this weekend. Richmond won both the Production B and Open B events finishing 1-2 in both class motos. In the Production B races he started fifth in the first moto before finishing second and led every lap from the holeshot in the second moto. In Open B, he came back from 13th to finish second in the first moto, and again led wire to wire in the second moto. He now leads the Production B Championship by seven points and is third in Open B points. Not bad for a guy who wasn’t even sure he was going to race this season! The rough conditions were even worse in the Pro motos. After getting a good handle on the track in qualifying, Rowe finished sixth in the first moto. 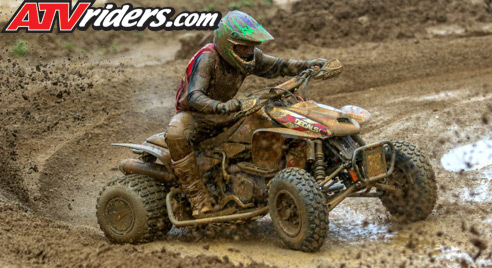 At the beginning of the second moto, heavy rains inundated the track and Rowe survived the chaos to finish seventh. The sixth-place overall finish places him 10th in points. Kyler Lenz Motorsports will finish off its exciting and successful inaugural season at the Loretta Lynn Ranch in Hurricane Mills, TN. That race is scheduled for August 11-12.